Decepticon Brushed Chrome-Black Emblems Decepticon Brushed Chrome-Black Emblems, Transformers Brushed Chrome-Black Emblems, DefenderWorx 900487 Body Emblem, Dodge Charger Emblem, Dodge Challenger Emblem, Dodge Magnum Emblem, Dodge Dakota Emblem, Dodge Durango Emblem, Dodge Ram Emblem, Chrysler, [DefenderWorx 900487 Body Emblem] - $29.95 : 3rd Strike Performance, Your Source for Late Model MOPAR Performance Parts and Accessories! 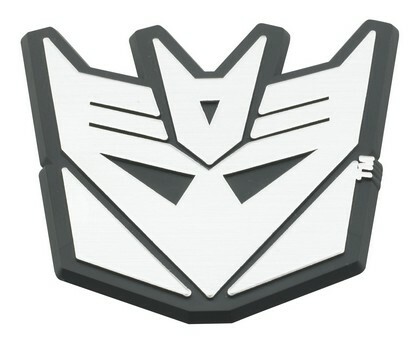 Transformers Decepticon Logo Trunk Badges are easy to install and add style to any vehicle. Sold as a pair. Based in Southern California, DefenderWorx started out manufacturing innovative billet aluminum accessories for the automotive aftermarket. Today, with over 10 years of industry experience under their belt, they have expanded their lineup with a host of new products and have earned a place at the top of the automotive accessory world. Thanks to their amazing quality and craftsmanship DefenderWorx has been trusted by some of the top automotive manufacturers, to produce officially licensed products. They have also had their parts featured on many show and movie vehicles over the years. The company is also proud to boast that all of their offerings are manufactured here in the United States, and with great customer service it is easy to see why DefenderWorx is at the top of their game.